Résumé : Double-decker buses, bowler hats, and cricket may be synonymous with British culture, but when it comes to their cuisine, nothing comes to mind faster than fish and chips. Sprinkled with salt and vinegar and often accompanied by mushy peas, fish and chips were the original British fast food. In this innovative book, Panikos Panayi unwraps the history of Britain’s most popular takeout, relating a story that brings up complicated issues of class, identity, and development. 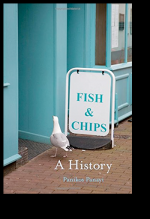 Investigating the origins of eating fish and potatoes in Britain, Panayi describes the birth of the meal itself, telling how fried fish was first introduced and sold by immigrant Jews before it spread to the British working classes in the early nineteenth century. He then moves on to the technological and economic advances that led to its mass consumption and explores the height of fish and chips’ popularity in the first half of the twentieth century and how it has remained a favorite today, despite the arrival of new contenders for the title of Britain’s national dish. Revealing its wider ethnic affiliations within the country, he examines how migrant communities such as Italians came to dominate the fish and chip trade in the twentieth century.